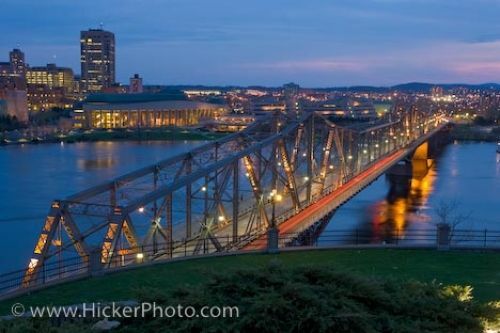 The Alexandra Bridge is beautifully illuminated at dusk as it crosses the Ottawa River from the city of Ottawa, Ontario to Gatineau, Quebec in Canada. The steel truss Alexandra Bridge which crosses over the Ottawa River from the city of Ottawa, Ontario to Gatineau, Quebec is beautiful as the lighting at dusk highlights the sky as the city and bridge lights reflect into the calm water. The construction of the bridge started in 1899 and was officially opened on February 18th, 1901. The bridge was used to carry trains, an electric trolley and carriage traffic but during the 1950's the Alexandra Bridge was upgraded for vehicular and pedestrian traffic. By 1966, all the railway tracks were uplifted and the bridge was solely used for cars and pedestrians. On either side of the Alexandra Bridge there is a museum and a park where tourists can enjoy the scenery which is breathtaking at dusk. Picture of the Alexandra Bridge at dusk which crosses the Ottawa River from the city of Ottawa, Ontario to Gatineau, Quebec. ... Bridge at dusk spanning the Ottawa River from the City of Ottawa in Ontario to Gatineau in Quebec, Canada.